The Medicare Shared Savings Program (MSSP) was created by the Centers for Medicare and Medicaid Services (CMS) as part of the Affordable Care Act (ACA) of 2010. Launched in 2013, the MSSP is CMS’s largest Accountable Care Organization (ACO) program, covering 10.5 million assigned Medicare beneficiaries in 2018. The MSSP is the key component in Medicare payment reform, utilizing ACO models to lead the transformation from fee-for-service (FFS) to value-based health care. It’s no secret that CMS’s strategy is to transition all healthcare providers to some form of risk-based reimbursement model. In fact, CMS’s goal for 2018 was to have 50% of its Medicare reimbursements distributed through value-based alternative payment models like the MSSP. With this vision in mind, the MSSP was designed with four different Tracks that offer valuable flexibility, attractive incentives, and helpful exemptions to those providers who are willing to take on more risk. Recognizing that the transition to risk-based models is inevitable, it’s important for providers to understand the methodology of the MSSP, including specifics regarding Track options, along with other considerations that will aid in assessing how much risk to assume verses the potential rewards available. The Medicare Shared Savings Program (MSSP) was developed from learnings that CMS realized through its 2012, flagship Pioneer ACO program, which served as somewhat of a “testing ground” for CMS and organizations already showing success in ACO-like models. Pioneer ACOs took advantage of multiple shared savings and risk options, and CMS used these ACOs as a resource for learning and implementing forthcoming programs, including the MSSP. Now in its sixth year, the MSSP has grown from 220 ACOs to 561 ACOs participating in performance year 2018. Involvement in the MSSP motivates ACOs to assume the financial responsibility and provider accountability of a patient population, while being incentivized with a percentage of achieved savings when meeting quality and savings performance requirements (or penalized when they do not). This approach to healthcare takes some getting used to because provider organizations have not traditionally been required to manage risk. For example, in the traditional fee-for-service environment providers are not held accountable for the number of tests ordered or procedures performed; rather, providers are reimbursed without penalty or reward, regardless of the quality of patient experience, patient outcome, or cost-efficiency. The CMS strategy is designed to encourage MSSP ACOs to progressively take on more risk as they gain more experience, through the realignment of incentives that reward value-based care as opposed to volume-based care. Within the MSSP, there are four Track options available, each requiring a three-year contract period, with limited renewal options, and each having different levels of shared risk arrangements and financial rewards. For example, Track 1 is the “on ramp” for ACOs, requiring minimal financial risk. The burden of possible losses is Medicare’s only (“one-sided”), not the ACO’s. The ACO agrees to be held accountable for the quality, cost, and experience of care of an assigned Medicare fee-for-service beneficiary population, but it is not penalized if it falls short of established benchmarks. If the ACO can make progress toward reducing costs, then it shares in a small percentage of the net savings over that year. For 2018, approximately 82% (or 460) of all MSSP ACOs are non-risk, Track 1 ACOs, indicating that most ACOs are proceeding with caution into the realm of value-based contracts. The Track 1 ACO program, however, allows for this maturation process, giving organizations the opportunity to manage risk and own accountability before being required to transition into a modified downside risk contract in year three, or before converting to one of the riskier two-sided Tracks, which requires more financial responsibility and provider accountability. In Tracks 1+, 2, and 3 ACOs share in the savings and the losses associated with performance. Two-sided contracts require ACOs to share different levels of the risk loss responsibility to receive a greater percentage of financial reward when successful. It’s important to note that once an ACO has committed to assuming more risk in a particular Track, it cannot return to a previous Track model. 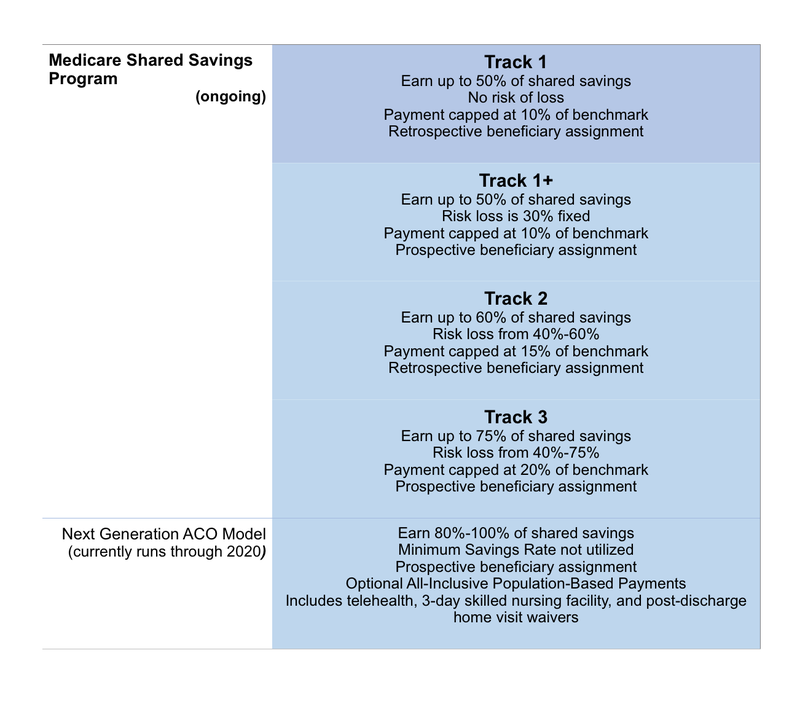 Below is a comparison of the four MSSP Tracks, including a fifth option, the Next Generation ACO Model, designed and implemented in 2016 as a pseudo-extension of the MSSP with even greater financial risk and possible reward. The Milliman White Paper report is a must-read for any ACO considering joining the MSSP. Of note are the authors’ attention to beneficiary “assignment windows,” specifically prospective and retrospective beneficiary assignments, and how these windows can have operational and financial implications. In addition, methodical attention is given to the financial parameters that create different risk/reward profiles for each Track in areas regarding Shared Savings/Loss Percentages, Minimum Savings/Loss Rate, and Percentage Payment/Sharing Limits. For supplemental descriptions of key terms and statistical examples of ACO shared savings payment and shared loss recapture, rewards and risk, see the exceptional articles by Timothy D. Martin and Neal D. Shah listed at the end of this article. Although these are important concerns that must be evaluated and settled by those participating in the Medicare Shared Savings Program, there are several rewards worth considering that help to balance the associated risk. As outlined earlier, the MSSP is designed so that when ACOs assume greater risk loss accountability, they are rewarded with greater financial shared savings potential. Track 1+, 2, and 3 MSSP ACOs earn up to 50%, 60%, and 75% shared savings respectively, with higher, benchmark payment caps. Also, because Tracks 1+, 2, and 3 take on greater financial risk, they are considered Advanced Alternative Payment Models (AAPM), whereas Track 1 is not. This is significant because AAPMs are exempt from the burden of the Merit-based Incentive Payment System (MIPS) reporting and scoring guidelines, as well as the MIPS +/- payment adjustments/penalties that start at 4% in 2019 and increase to 9% in 2026+. In addition, because they are AAPMs, Track 1+, 2, and 3 ACOs have the potential to receive a 5% lump sum MACRA bonus from 2019-2024 for meeting quality performance standards. Furthermore, Tracks 1+ and 3 offer more flexibility for ACOs by offering waivers related to the Skilled Nursing Facility 3-Day Rule as well as fraud and abuse laws. Tracks 1+ and 3 also offer more clarity for ACOs by using prospective beneficiary assignment for quality reporting and financial reconciliation. Finally, studies show that ACOs improve in providing better quality care and become more cost-efficient the longer they participate in the MSSP. This risk-development process has shown to lead to greater rewards through shared savings, MACRA bonuses, and additional commercial contracts as ACOs gain confidence and experience in value-based care. 2018 is a significant year for the MSSP, representing a culmination of planning and strategizing to motivate ACOs to transition to more financial risk and provider accountability. Mandatory Track non-renewals, MACRA bonuses, and MIPS exclusions and payment adjustments work as catalysts to motivate ACOs to venture into more risk with the potential for significant financial rewards. Understanding the flexibility, incentives, exemptions, and overall strategy of the MSSP will help ACOs to navigate the associated risks and rewards in today’s value-based care environment. Herbal, Jill S. et al. “Differences Between Medicare ACO Tracks that may impact ACO Financial Results.” Milliman. October 2017. Martin, Timothy D. “The Risks and Rewards of ACOs.” Journal of AHIMA. April 22, 2011. Shah, Neal D. “The ACO ‘Track One+’ Model: New Rewards for Risk.” AHLA. May 2017.